It was so exciting for my husband and I to dream up and create this room for our first child, our baby girl, Lyla Jordan Zahara. This color combination had been a favorite of mine since we first found out we were pregnant, so I was so excited when I found out we were having a girl! We moved house 6 weeks before Lyla was born so we had to work pretty fast - thank goodness for a lot of snow days in February! It all came together in about a week and we couldn't have been more in love with the end result! Some Pinterest, some Etsy, and some awesome blogs! The dresser was a jump off point - it was mine growing up and I had it in my head all along to repaint it a brand new white and add the crystal knobs for some dazzle. From there, I looked for ideas and inspiration that worked with that piece of furniture. I loved the idea of keeping it simple, but sweet. Big statement pieces (chandelier, metallic L, repainted dresser) with a few sweet and sentimental details. I was so proud with how the dresser turned out - it looks beautiful, especially with the new paint job and those knobs! I had been a little worried that the wall color we chose might be too dark when the whole room was painted, but I just fell more in love with it. It's deep, soothing and the white furniture looks incredible against it! As inexpensive as it was, I LOVE the effect of the metallic L in the frame. It's such an eye catcher when you walk in the room. The headband organizer - this was a gift we received at our wedding a year before from a sweet lady in our church, but hadn't found the right spot in our house for it even though we really liked it. It struck me that it would be the perfect wall hanging to display and organize Lyla's headbands (and mittens and hair clips!). We painted it with the Valspar 'Snowcap White' color so it matched the dresser... and voila! Keep searching and digging for those bargains. We certainly didn't have a huge budget for this, and not a lot of time to pull it off, but with some good research we were able to create exactly what we wanted for our baby girl! I usually don’t like dark colors for babies, but you make it so pretty. Congratulations! You did a lovely job! 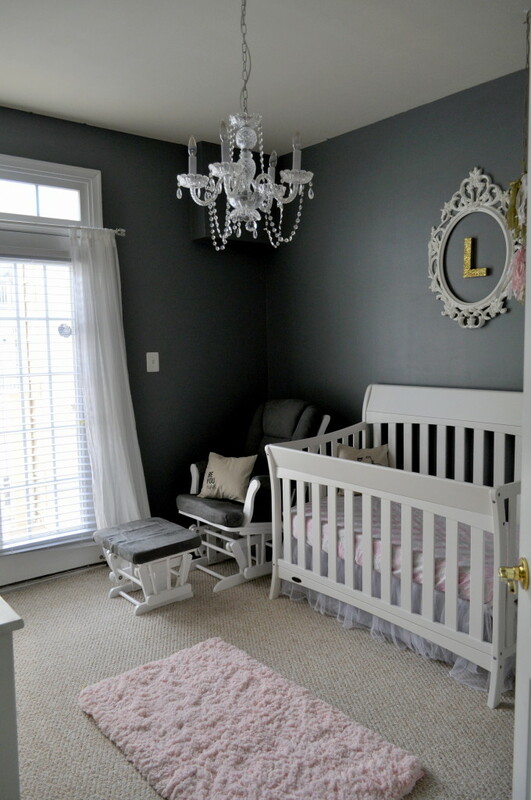 I am expecting my first granddaughter and I am planning a nursery/ guest room for mom and dad! I am going to paint the furniture with white Annie Sloan chalk paint but was looking for inspiration for hardware replacement and love the crystal knobs! Thanks for sharing! Congratulations on you new baby girl! An Aussie girl living and loving in Washington DC! Married to Jordan and mum to Lyla Jordan Zahara.